TL; DR: Whether you’re a pro building multiple sites for clients or an admin who needs to make quick changes to a webpage, mojoPortal offers an easy-to-use, customizable, and extensible open-source content management system to meet your needs. The CMS is ready to go right out of the box and includes all the common modules employed by most websites, including blogs, webstores, and galleries. This helps expedite web development processes for devs, saving them both time and money. For site owners and admins, mojoPortal makes content management a breeze, allowing users to seamlessly update websites without the need to code. Because of its versatility, thousands of sites worldwide are being built and managed with mojoPortal. The Texas Military Department (TMD) operates with the mission to have trained forces at the ready to protect the citizenry of Texas and the United States at home and around the globe. In addition to this large responsibility, the organization is charged with providing seamless access to information and services available for active military personnel, veterans, and their families. TMD needed a public-facing site with an interface that allows admins to easily enter and revise content to keep visitors updated with the most relevant information. To accomplish this, the organization turned to i7MEDIA and the company’s effective CMS mojoPortal. Members of the mojoPortal dev team, Joe Davis, Elijah Fowler, and Isaac Hall, help businesses simplify site creation. By using mojoPortal, i7MEDIA was able to easily develop a comprehensive site employing numerous forms and modules. TMD’s site presents an image-heavy aesthetic creating a dynamic experience that makes it simple for users to navigate to what they’re looking for. TMD and i7MEDIA provide a perfect example of how mojoPortal is helping both developers and site owners save time and money. The platform has helped build and simplify content management for thousands of sites around the world, from the Akron-Canton Food Bank to the University of Florida’s Academic Affairs subdomain. Because of mojoPortal’s intuitive content entry functionalities, site admins save a tremendous amount of time updating their sites. The platform also works to ease web development processes for seasoned developers. Its open-source software comes complete with built-in forms, image galleries, and calendars, among many other features. This removes the need to create these items from scratch, which translates into quicker time to market and increased opportunities to take on additional revenue-generating projects. Joe told us mojoPortal was originally built as a response to the frustration developers were experiencing in the early 2000s with the lack of effective content management systems. The CMS was developed with the idea that it would help them streamline application builds. At the time of its release in 2004, the type of CMS platform mojoPortal offered was uncommon. 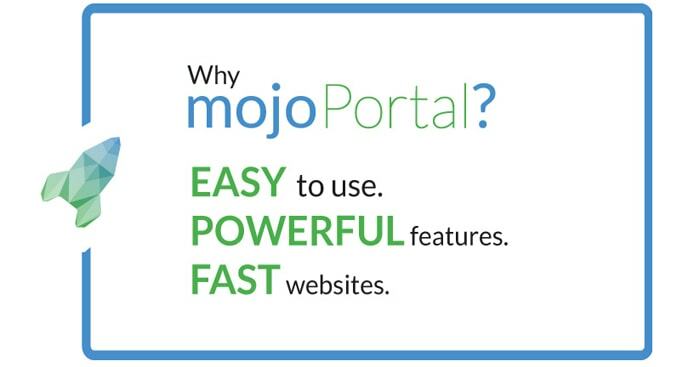 The first of its kind, mojoPortal was originally built to expedite web development, saving developers time and money. The first CMS of its kind, mojoPortal would evolve into a cost-effective cross-platform solution with expanded features for users at any experience level. Joe quickly realized mojoPortal was an effective solution. With mojoPortal, Joe was able to build a robust site and provide an intuitive CMS on which his client could easily make content updates. The CMS offers a modern, simplified approach to content creation and ensures usability across skill levels. The mojoPortal CMS strikes the balance between expediting web development processes for designers and making content entry and modification simple for the less-experienced site owners. While mojoPortal was originally conceived to aid the pros, it has since evolved into a highly user-friendly platform serviceable even by those with no coding experience. “Our goal is to implement features that make both parties happy,” Joe said. The user-friendly apps created with mojoPortal help optimize the creative process for site owners. And even end users benefit by removing the need for continuous support. The implementation of this new module simplified TMD’s site navigation and has been used by i7MEDIA in recent years for numerous sites. Joe also told us the creation process could take as little as a few minutes to an hour, depending on the desired complexity. Advanced modules and features help sites, like TMD’s, get new content up and running in no time. 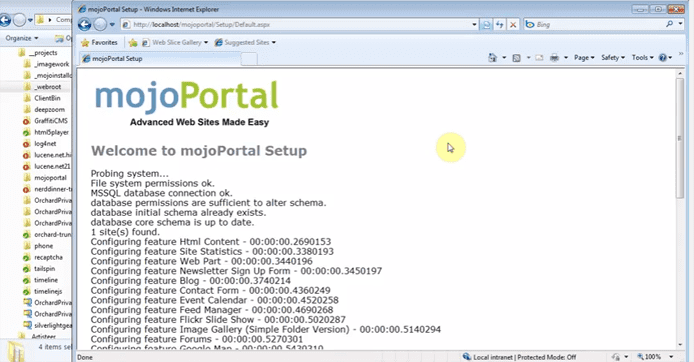 Adding image galleries, calendars, forums, and blogs to sites is easy with mojoPortal. Among the most used built-in features is the inclusion of forums and SEO, which are often paid services on most CMS platforms. The mojoPortal CMS was built to give anyone the capability to build a website without requiring coding knowledge. Developers and clients alike can craft appropriate apps and pages depending on the unique needs of the organization in question. Businesses and nonprofit groups have used mojoPortal to create eye-catching websites for their charities, churches, shops, and Boy Scout troops. The nonprofit nature of many of these organizations makes money-saving CMS solutions all the more appropriate. Joe told us about one such organization he worked with that was previously employing Joomla. The organization’s board of directors changed annually, meaning photos and bios needed to be swapped on its site continuously. The mojoPortal CMS provided an easy-to-use solution that allows users to easily make these updates. “Now we’re saving them time and keeping them from becoming extremely frustrated,” Joe said. According to Joe, mojoPortal plans to release more free and paid themes. This will help mojoPortal’s aim to continue to offer designers the ability to create large, easily navigable sites, like the Texas Military Department’s.